Hurricane season in the Atlantic begins June 1st and ends November 30th. The Eastern Pacific hurricane season begins May 15th and also ends November 30th. 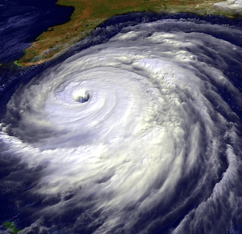 Are you prepared for this hurricane season? It is important to plan ahead prior to a hurricane in case of any unforeseen emergency. Natural disasters can be unpredictable so it’s best to prepare for any circumstance with anticipation. Water – One gallon of water per person, per day for at least 3 days. This can be used for drinking or hygienic purposes. What other items do you suggest are included in your hurricane preparedness kit? Does your family have a plan of action in case of an emergency? Share below!